A bunch of young children gathered underneath the bridge. 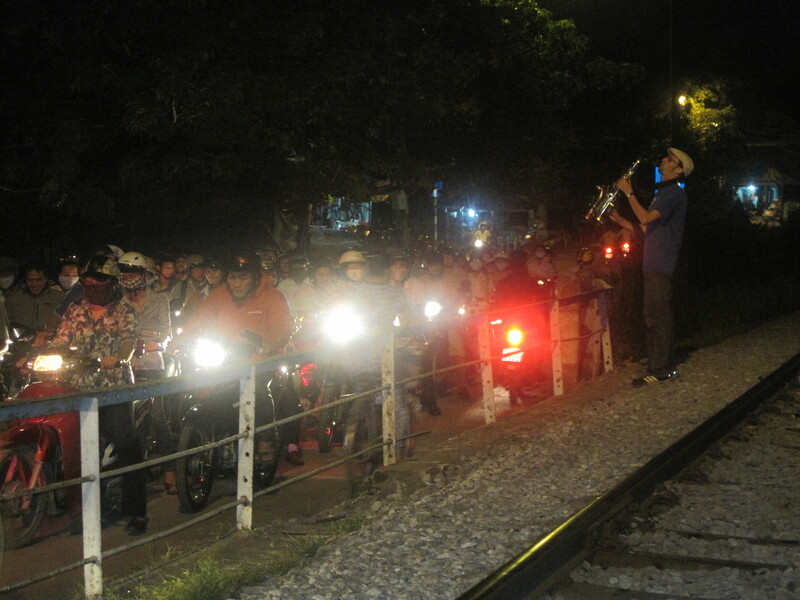 This performance was part of a larger series of street performances taking place right in the thick of the Saigon rush hour. You can see more photos and read more about the theoretical background of this in my previous blog post. Also, it has gotten some major press, including this English article and video from TuoiTre news. Today Tina, the owner of the Faifoo Hotel where I’m staying, took me around to a couple flute shops and introduced me to the head of the traditional music department at the local conservatory. He taught me a bit about the various types of Vietnamese flutes, some of which I’m pretty hopeless at, and others I’m pretty good at. I was particularly intrigued by one that had no keys. The flutist is required to manipulate the overtone series with his breath, plus the palm is used to further influence the sound by closing and opening the hole at the bottom of the flute. (I am now realizing it would have been useful to get some photos and video of this.) In the evening, the professor invited me and Tina to play with him at a church gallery opening for Christmas. 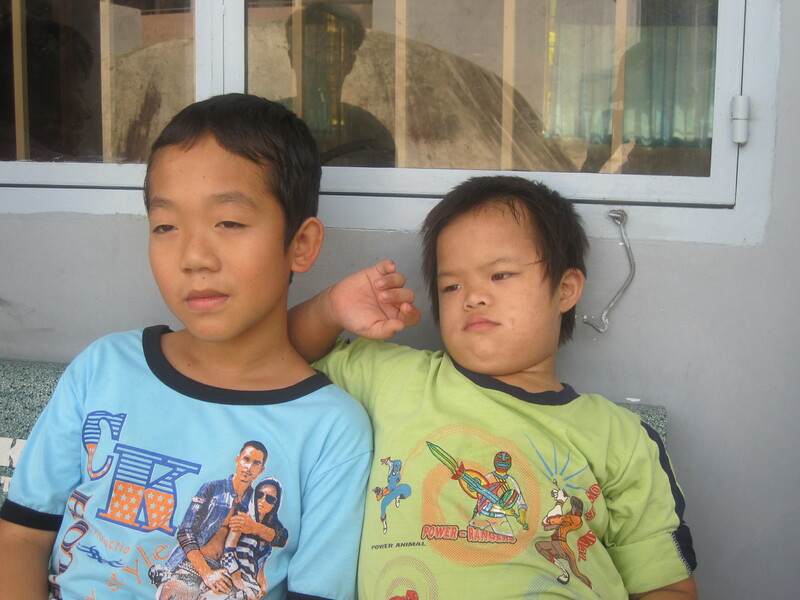 In the afternoon, I played at a little school for disabled children, in a small town a couple hours north of Saigon. Disabled children checking out the saxophone. 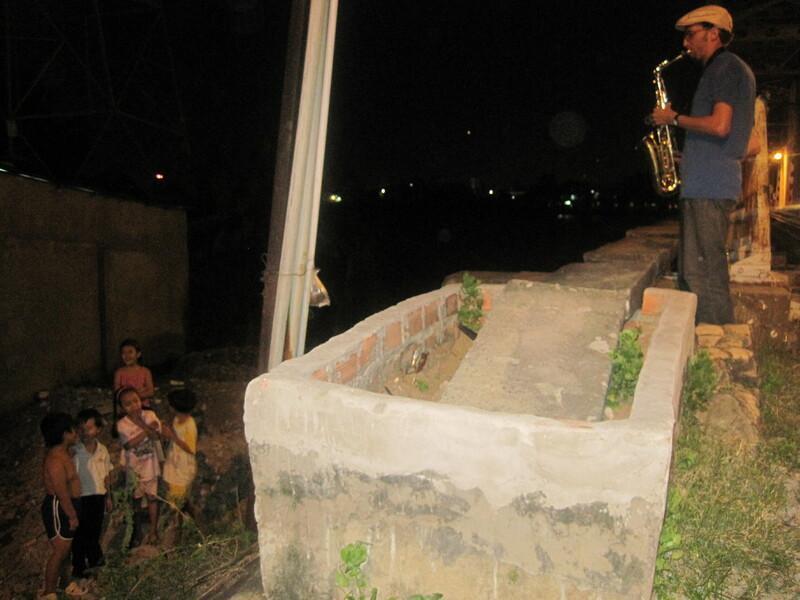 In the evening I played at the Kid’s World Kindergarten where there was a big fundraiser for an orphanage. The fundraiser will go through most of January, so there’s no telling how much money will eventually be raised. Huyen the head of the school will keep me posted, and I’ll report back! Today, I went to Dau Tieng, one of two places where my father served during the war here. I am under the impression that things haven’t changed much there. 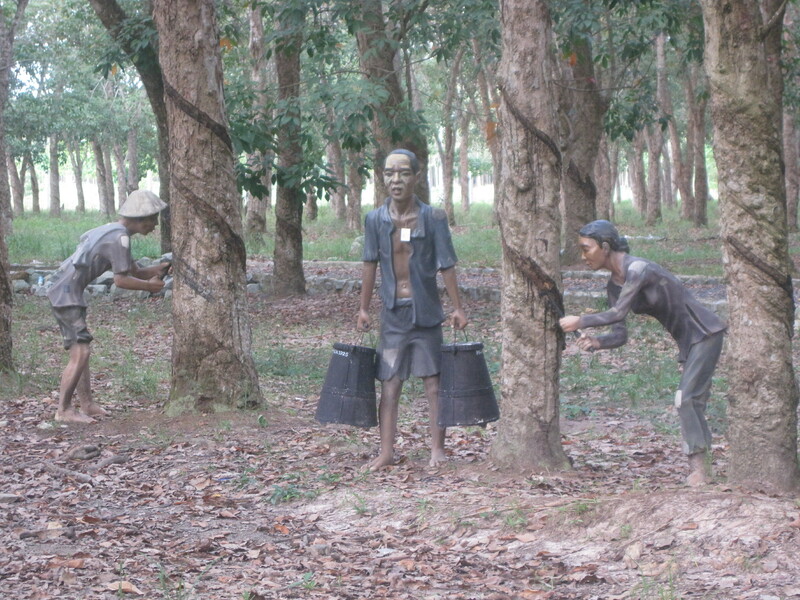 My father remembers lots of rubber trees, and from what I saw, there are still lots of rubber trees. If you ask around about what to do or where to go in Dau Tieng, they will only tell you about rubber. If you ask if there is any special local cuisine, again they insist that their little town has nothing but rubber. There is a small museum dedicated to rubber, and the French exploitation of their resources during colonial times. 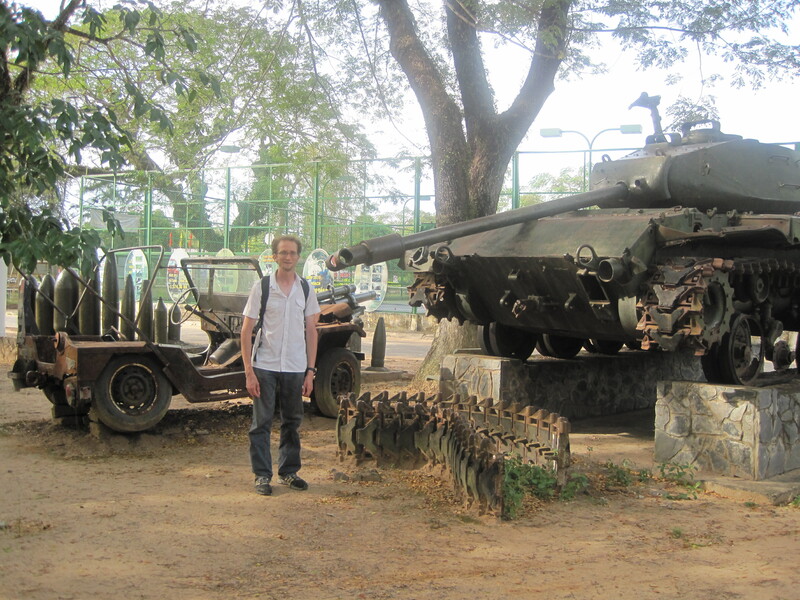 Not far from the rubber museum, adjacent to a traffic circle, are a few collected remnants of the American military presence in Dau Tieng, including a tank, a helicopter, and some unexploded missiles. 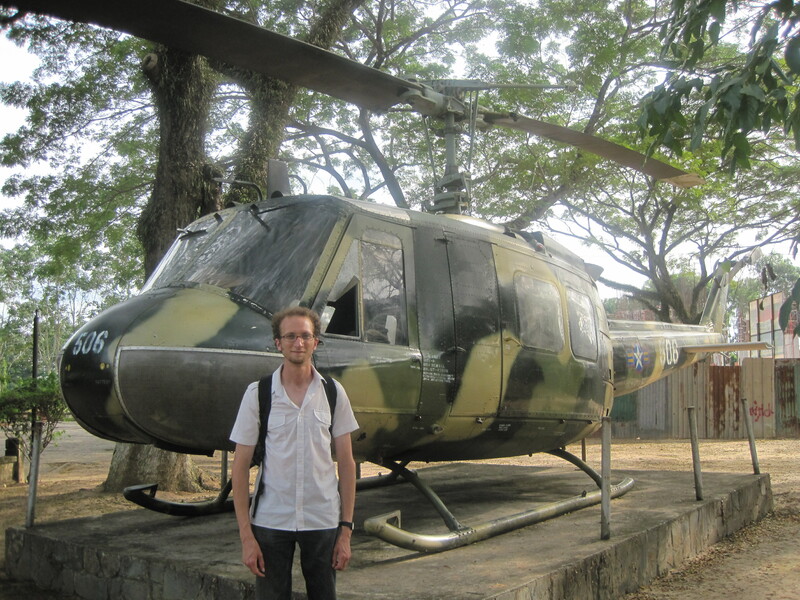 An American helicopter, leftover in Dau Tieng from the war. I’m disappointed to report that, even after asking around a bit, I was unable to figure out where the US base was located. I know my father is interested to know what’s there now. He told me the base was overrun by enemy troops immediately after he left. Like I said, if you ask most of the residents about their town, they will only tell you about rubber! Maybe next time, I will see if I can consult an expert on the matter. Not far from the tank and helicopter, was a little volleyball court, where I gave a really quick performance. 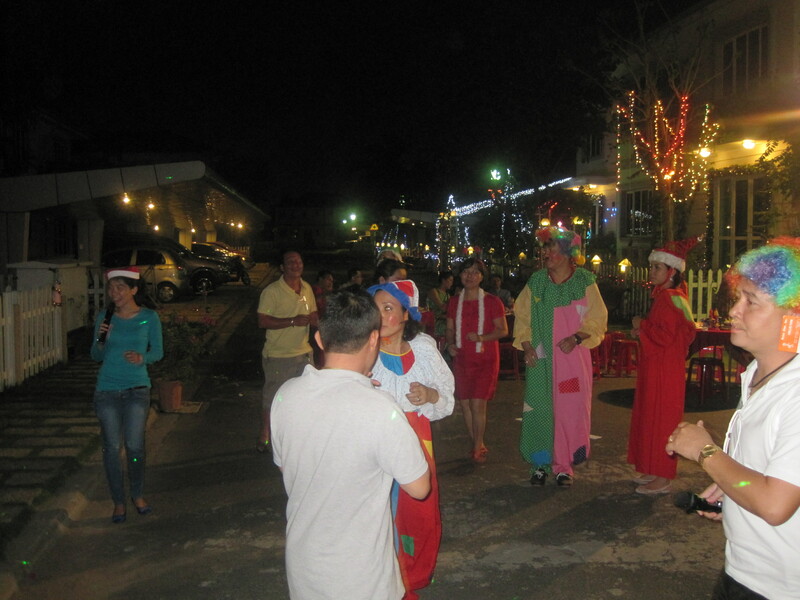 This Christmas Eve day I played at the April 30th Park in District 1, Saigon. It’s called the April 30th park, because that was the day in 1975 when Vietnam was reunified and finally independent. 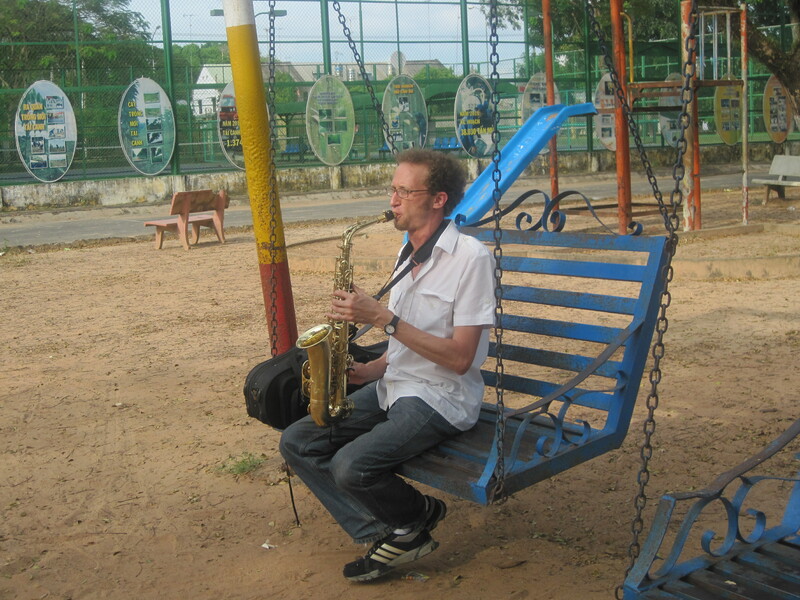 The park is a great hang-out for university students, and has generally been one of my favorite places to play in Vietnam, though this trip I have neglected it a little because my of my rush hour performances. I always get a lot of photo requests at this park. My guess is that I’m on quite many young Vietnamese Facebook profiles because of this. 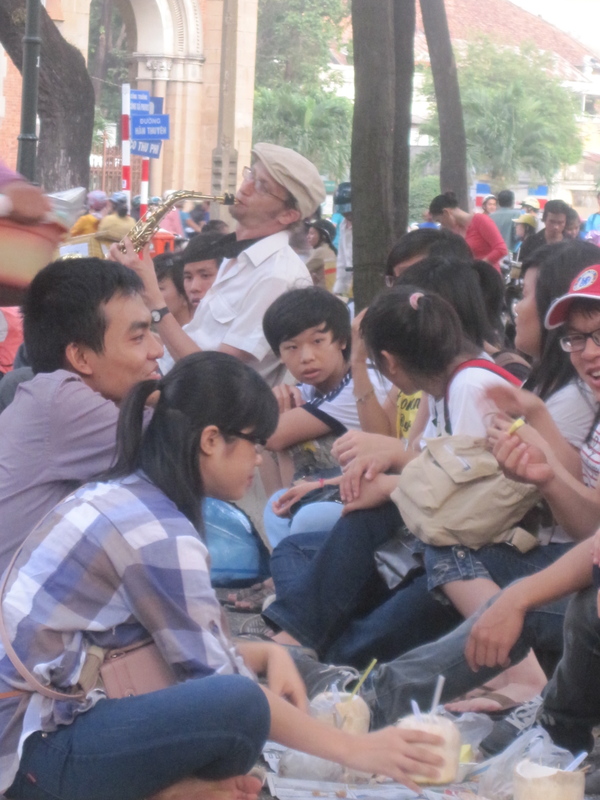 Facebook is often blocked here in Vietnam, but that doesn’t stop the young people from loving it. Has anyone seen this photo on Facebook yet? 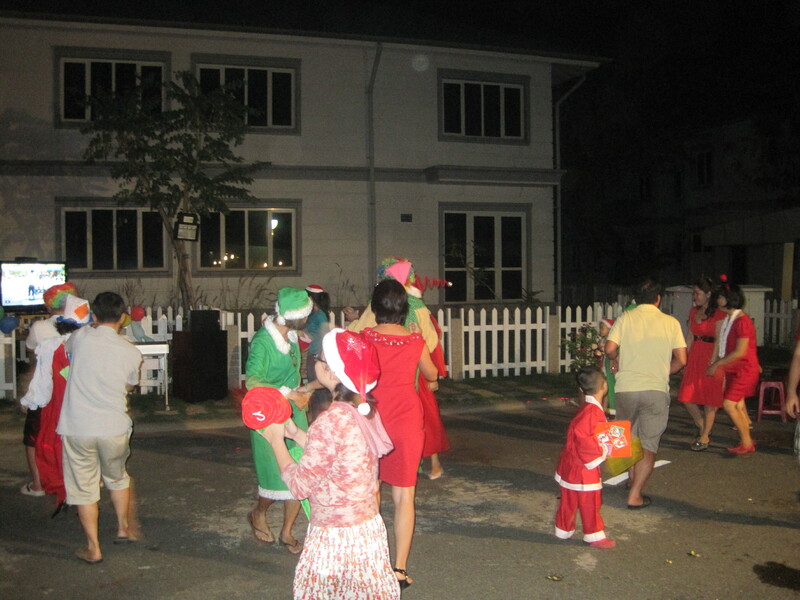 In the evening, I attended a Christmas Eve party in what is probably the only suburban style “subdivision” in Saigon. It is almost surreal to see such a quiet neighborhood in the middle of this very dense city. 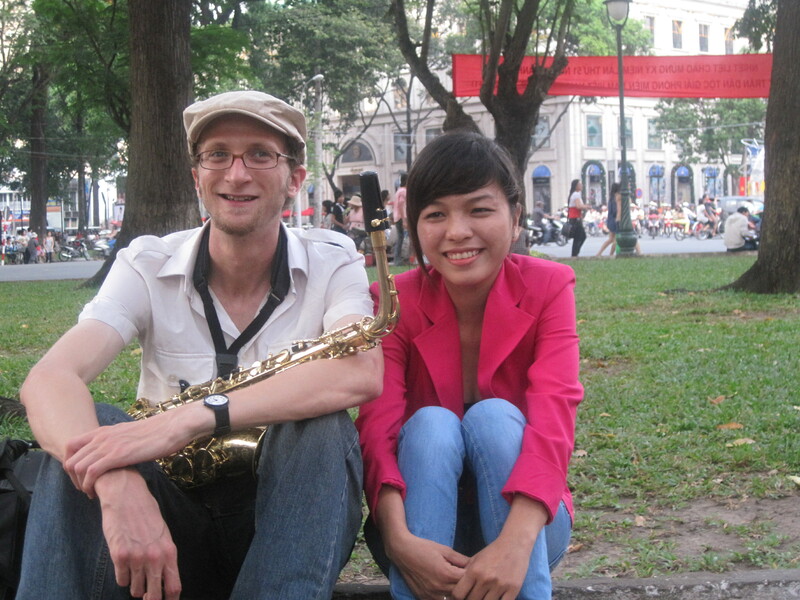 I played a little, but mostly I partied for my last night in Saigon. There were actually people dancing in the street! It was a lovely night, many thanks to the neighborhood hosts! Tomorrow, I make the long journey back to New York, but I know I’ll be back. In the meantime, I’ll be thinking about how to take the Parade of One project to the next level. I plan to immediately start work on continuing my involvement in Rwanda. Hopefully, 2012 will bring the first Parade of One intercultural collaborative album. The plan is to bring Rwandan vocalist and inanga player, Sophie Nzayisenga, to New York for street performances and to record an album with me and my people here. You can hear some rough recordings of what I’ve already done with Sophie at this link. Surely, I’ll be keeping you posted. The Parade of One project is grateful for the kind support of individuals like you who make it all possible. Please consider making your tax-deductible donation this holiday season by visiting the Parade of One website. At the time of this publication, we are still offering holiday gifts for donors, but only while supplies last!